Book are available from Beginning to Advanced playing level and feature tabulature that is large, dark, and easy to read. An instructional CD comes with most books, allowing you to play along as you progress through the songs and practice exercises. Be sure to let me know if there are other books you would like to see offered. Enjoy! 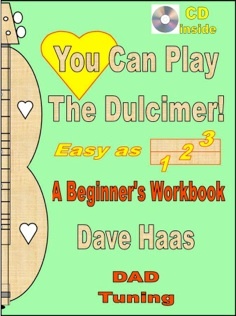 This workbook/CD set was written for beginning dulcimer player. There is a brief description of the history of the instrument followed by how to hold the dulcimer, read music, read tabulature and tips for smooth playing. All song arrangements are have an accompanying track on the CD of the song played at both a slow and moderate pace. This allows you to play along while learning the song. 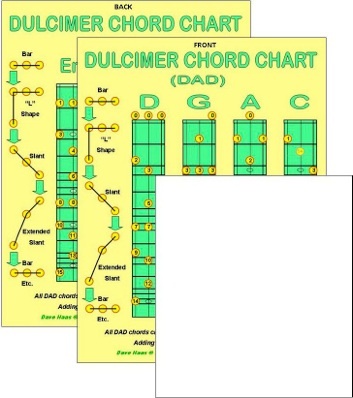 On the back page is included a chart of backup chords in two different positions on the dulcimer. This allows you and early start on playing with others in a jam session or other gathering. < Click on the Back (Left) Arrow on your Internet Browser to return to this page on the website. Closing the .pdf file will also exit the webpage. 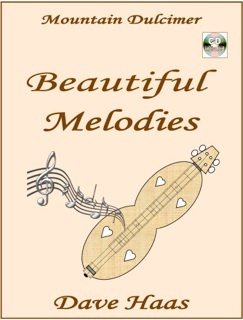 This workbook/CD set was written for the novice-intermediate player who desires to make beautiful melodies on the mountain dulcimer by playing notes one at a time (arpeggios). The book is more than a collection of songs - it provides detailed written and audio instruction on how to play arpeggios on the mountain dulcimer. The workbook consists of 17 song arrangements and 15 arpeggio exercises which build the skills necessary to play beautiful slow and melodic music on the dulcimer. All of the songs and exercises are referenced to the accompanying CD, which allows the listener to play along with the CD while learning how to bring forth beautiful melodies from the mountain dulcimer. -< Click on the Back (Left) Arrow on your Internet Browser to return to this page on the website. Closing the .pdf file will also exit the webpage. This workbook/CD set was written for the intermediate-advanced player who aspires to create musical arrangements by playing melodies in different positions on the fretboard and by creating song medleys. This book is more than a collection of songs - it provides detailed written and audio instruction on how to play advanced arpeggios on the mountain dulcimer. The workbook /CD consists of 26 song arrangements, 8 arpeggio exercises, and 42 audio tracks which build the necessary skills to play beautiful slow and melodic music on the dulcimer. All of the songs and exercises are referenced to the accompanying CD, which allow the listener to play along with the CD while learning to bring forth beautiful melodies from the mountain dulcimer. 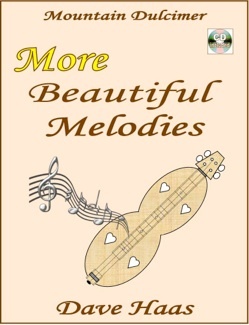 “More Beautiful Melodies” expands upon the work begun in “Beautiful Melodies”, and presents the dulcimer player with more challenging arpeggio exercises and song arrangements. The workbook/CD provides stand-alone instruction and does not need to be purchased with “Beautiful Melodies”. For example, left and right hand positions are covered in both workbooks. Get ready for another adventure! 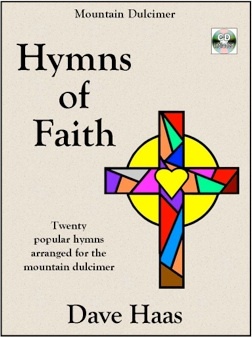 This workbook/CD presents 20 of the best-loved hymns, arranged for the mountain dulcimer. The arrangements are written in arpeggio style which allow these wonderful melodies to flow softly and smoothly from the mountain dulcimer. All of the hymns are referenced to an accompanying CD, which allows the listener to play along with the CD while learning to play these beautiful hymns. I pray that this music richly blesses your life and the lives of all those around you. God bless you. 2-CD Set - 2.3 hours of instruction! This workbook/2-CD set was written for all who aspire to improve their playing of fiddle tunes and other songs with a fast tempo, and build their repertoire of songs. 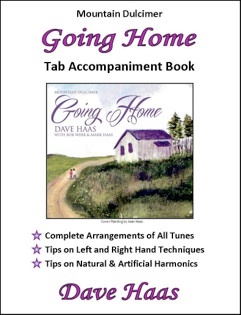 This book/CD provides 2.3 hours of detailed written and audio instruction on the left and right hand techniques needed to play quickly, cleanly, and smoothly. The workbook consists of 32 popular song arrangements and 11 exercises which build the skills necessary to play fiddle tunes and other fast songs on the mountain dulcimer. Many of the songs included are those played in jam sessions and at club meetings. Also included is a description of first and second position backup chords, and how to use the “chop” to liven up your backup accompaniment. 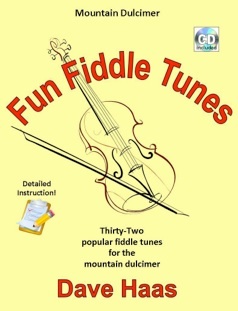 All of the instruction, songs and exercises are referenced to the accompanying 2-CD set, which allows the listener to play along with the instructor while learning to bring forth lively fiddle tunes from the mountain dulcimer. This one-page, two-sided laminated chart shows the most frequently played major and minor chords and chord shapes. The chart is useful for understanding how the chord shapes relate to each other and the different chords appear along the entire length of the fretboard. It also helps to identify many of the two and three-finger chords you are currently playing. There is no CD with the book. The CD is sold separately. This books will provide you the inspiration and tools to create 3-4 minute arrangements of your favorite tunes. Complete arrangements of all tunes with the melody of most songs in a second position (bass, octave) on the dulcimer fretboard. Introductions and endings for all tunes. Detailed description of left and right hand techniques for both fast and slow songs. Detailed description of natural and artificial harmonics (chimes). Sample Pages will be uploaded soon! Let’s Jam! Book with 2 CDs!  Backup Chords (in two positions) on back cover. This book was intended to provide a large collection of of the tunes played in today’s jam sessions. 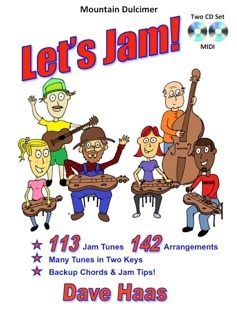 Great as a help during a jam or as a resource to learn jam tunes, this book is quickly being adopted by many clubs as their official “Jam Book”. Twenty-nine of the tunes are traditionally played in G or A. Many of these have be adapted by dulcimer players in the key of D. In these cases, I have included an arrangement in D and a second arrangement in either G or A. This will allow dulcimer player to be more comfortable playing with fiddles, banjos, and other old-time instruments. Sample Pages and MIDI samples uploaded soon!